If you haven’t heard of the White House Vegetable Garden, it was a garden spearheaded by Michelle Obama. And I was surprised to hear that the First Family does have something from the garden at every meal when they are in residence. The garden was also featured in American Grown: The Story of the White House Kitchen Garden and Gardens Across America (you can see a ton of pages from the book there using the look inside feature). I love that she included 2 garden beds that are devoted to plants with seeds from Thomas Jefferson’s Monticello gardens, all old time heirloom varieties. She also did a celebration of the traditional “three sisters” (squash, maise/corn, beans) and started a White House beehive. And here is an older video showing the original garden being planned. Passion for Green went to the Seed Savers Exchange in Iowa (jealous!) and posted pics of their demonstration garden as well as how Seed Savers Exchange does trellising in their gardens. I really hope there will be more posts about this trip! SoloMomLife did an entry about what she learned from community gardening – part one on community gardening was featured on The Thrifty Mama. Mavis from One Hundred Dollars a Month shows off her amazing garden now that summer is upon us. Be sure to take a look around the site as well, she has a ton of helpful posts on lots of gardening things. Her goal is to grow 2,000 pounds of food this growing season – she is already up to 55lbs harvested. Lucy’s Garden did an update on her wonderful heirloom gardening – definitely check out her artistic plant markers. Here We Gro did an amazing post that comes from the recent Nature tomato study about how they believe a meteorite caused the stressful conditions and the red hue of most tomatoes we know today, with lots of pics to go along with it. Such a big genome expansion points to extremely stressful conditions. We suspect that the meteorite crash and the resulting solar eclipse had created conditions difficult for plants to survive. A distant ancestor of the tomato plant then reacted by expanding its genome considerably in order to increase its chances of survival. And here is a link to the Nature article if you missed it. Anne’s Savory Dish has a post about her organic gardening. Sense of Home Kitchen did a post about her Kitchen Garden with some great photos – the strawberries in the first photo make me want to bend down and pick the ripe ones. Balking at the cost of tomato cages? Giant Veggie Gardener shows how to make your own tomato cages – I love the idea of making a “u” on one end to make it so much easier to place in the garden, especially if the tomatoes have already reached that unwieldy stage where trying to fit a tomato cage over from the top is a challenge to the patience of any gardener. Lifescapes did a post on some history of tomatoes. And found an amazing article on Porter & Son seeds, a company which unfortunately closed in the 1990s. Susan Wittig Albert is also an author with many published books and a podcast you should definitely check out. There is a new book out The Seed Underground: A Growing Revolution to Save Food by Janisse Ray. About to be released soon, here is a review about it. I will definitely add a book review if I manage to get a copy. Janisse Ray also has her own webpage and includes a list of the many events she will be speaking at. Another new gardening book came out a couple of months ago, Heirloom Gardening in the South: Yesterday’s Plants for Today’s Gardens. Another issue which is so disappointing to see, Reason.com did a roundup of where gardeners have been subjected to fines for running afoul with city ordinances with their gardening. Urban Expressions did an article about Savouring our Heritage and includes information on a workshop for those in the Montreal area. Christopher Sisca of The Cabinet shows off his amazing garden photos including a before and after. Amazing how fast plants grow. And if you are wondering how to turn those forgotten potatoes that began sprouting to good use in the garden, he shows how to plant those too! Curbstone Valley Farm has a great how to on how to graft heirloom tomatoes and the followup. Now for some cooking goodness! The Makery made fresh pesto pasta with baby heirloom tomatoes and includes the recipe. The photo is amazing. Channeling the Old Lady Within has a recipe for Marinated Heirloom Tomatoes in a Sweet Walnut Vinaigrette. Check out the photo of the monster tomato from her garden too. Keep your diet real has a recipe for White Bean & Heirloom Tomato Bruschetta. Zabar’s has a recipe for Marinated Heirloom Tomato Salad. I love tomatoes, especially anything that includes fresh basil too and I will definitely be making this over the summer. Areas in the Southern US are facing plenty of tomato problems this year because the weather is too hot at night, resulting in a great deal of blossom drop (we included a video about blossom drop at the end of this post). If you live in a region with high nighttime temperatures (75-80F) and there are just not enough insects in the garden to pollinate, consider planting a heat resistant variety of heirloom tomatoes to get a larger tomato crop each summer. Fortunately there are plenty of heirloom tomatoes available that can still thrive in hot climates. If your tomatoes are already planted and you are trying to salvage some potential tomatoes this year, here is a video on dealing with blossom drop on tomatoes and peppers and making a compost tea. Here is our heirloom gardening round up from the past week. 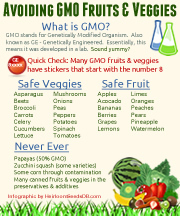 First, if you didn’t see our Avoiding GMO Foods & Veggies, be sure to share it! Happy Child CSA was talking about their crop of heirloom tomatoes. The Imperfect Gardener has a great post for anyone selling their heirloom veggie plants at a farmer’s market type event. She talks a lot about what she will do differently based on the expereinces her first time out. Highly recommended to read! Sacramento Vegetable Gardening has a great post on heirloom tomatoes – and check out the photo of his PVC tomato cages if you are looking for different types of tomato cages. And there are Stupice tomatoes growing already. Northwest Backyard Veggie Patch was talking about how her heirlooms aren’t being attacked by bugs while her non-heirlooms are – this is great because so many people assume heirlooms are so much more suseptible to all kinds of bugs/diseases compared to hybrids. The Fun Projekt was building veggie boxes for her garden, and shows that there are still people being neighborly, even if you haven’t met them yet! Flour Sack Mama did some gardening… I can’t stop looking at that photo harvesting Microgreen Freckle Lettuce. Still be a bit off before I can harvest any of my lettuces. StoryMusing did a review of the book Beginner’s Guide to Heirloom Vegetables. DisasterPrep blog has an article about planning a survival garden with heirloom seeds. Lou Murray’s Green World talks about some heirloom pumpkins amongst other things being planted in the garden. Nomadic Chef talks about the heirlooms he planted (mostly peppers and tomatoes). And the mention of the Chocolate Sweet Pepper made me hungry! Terry’s Square Foot Garden has a ton of videos for his square-foot-garden to be, and includes his sources for Canadian heirloom seeds. Lastly, I wanted to mention this post, although it is not strictly heirloom gardening. Huffington Post has a great post on how you can end up with BPA in the garden because of the gardening equipment you use. EEK! I am definitely looking into this one more and will post as I find out! But one quick recommendation he has is letting the hose run for a few seconds before you turn it on the veggies. Shopgirl Maria was making Heirloom Tomato Galette, including the recipe. Married Cat People made Vegan Quesadillas with Heirloom Tomato Salsa, with some pretty awesome (and making you hungry!) photos. A quick reference for what is safe and not safe when wanting to buy fresh fruits and veggies at the grocery store. 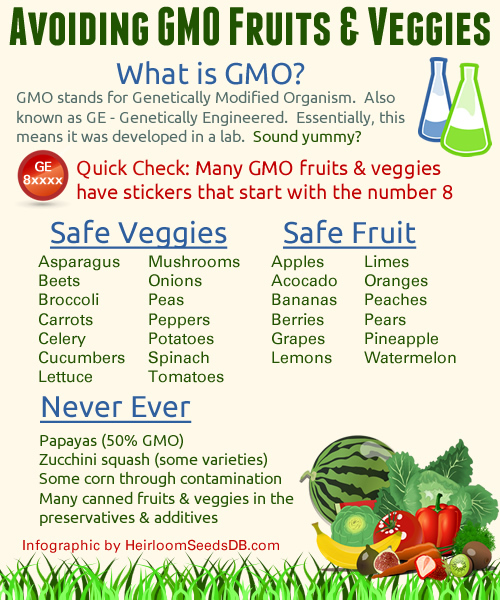 And we will keep it up to date as more GMOs unfortunately enter the market area Unfortunately GMO seeds are still becoming more popular with commercial growers (but that is a whole other issue I will be tackling soon). Please share! Or use our social buttons below to add to Twitter, Facebook or Pinterest! Here is a roundup of some of the heirloom gardening related blogs, recipes and events from the past week. Julie from Growing Days talks about building her garden beds for her non-GMO veggies. She also is using the Square Foot Garden method and shows us all the diagrams from her planting and exactly what she is planting. This is the blog post you should all read! I also have the book although I haven’t tackled this particular method yet, I have some leftover space I haven’t finished planting I could definitely try it out on. Seeking Abudance has an awesome entry about sharing a passion for heirlooms with her neighbor, and she talks a great deal about companion planting, another passion of mine! Mad Dogs & Englishman listed out the heirloom veggies being planted this year – it is also a great started list for others starting out heirloom gardening too. Made by Jane is doing the Urban Farm Challenge and has posted what she is growing – although I think my favorite part was seeing how different heirloom seed companies packaged the seeds in the pic on her blog… it seems every company does something very different. And for something completely different, Kathleen Ernst has written a book called The Heirloom Murders (just featured on Inkspot) includes the importants of preserving heirloom plants and seeds. I was disappointed to discover my library doesn’t have it. You can also visit her homepage here and her blog entry about the book here. 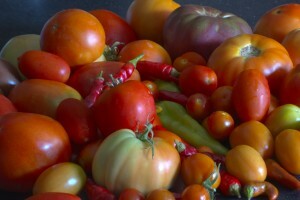 True Food Movement has a piece on heirlooms and diversity. There are some great heirloom tomato photos over at My Tiny Plot. The pics of the Green Zebra make me wish mine were closer to harvest date! Now into the kitchen, here are some fun heirloom recipes we saw in the blogosphere this past week. From the Cooking’s Good blog and she also mentions the Heirloom Tomato cookbook by Amy Goldman. I never would have thought of putting lavendar with brushetta, I would love to hear from anyone who tries it out! May 19, 20, 21, 2012, Tree & Twig Farm, Niagara, ON. Have an event for this weekend or next? Post a comment and we will add it Did we miss something awesome you did with heirloom gardening in the past week? Also let us know and we will try and include you next week! I came across this video on Youtube, a neatly one hour video featuring guest speakers talking about seeds and biodiversity. There is also Q&A in the video as well, which asks some pretty tough questions, such as irradiated seeds. Well worth the time to watch. One of the speakers brings up a really interesting point that it is better to grow heirloom plants where they grow best, because you might be saving seeds in a climate where they don’t produce the best germination as well as in better climates. So you could actually be saving inferior seeds. This forum was part of the Reskilling Expo held 2/26/11 at the Live Oak Grange. Speakers include: Arty Mangan, Bioneer’s Food and Farming Director, works with indigenous and biocultural seed projects; Benjamin Fahrer, a permaculture designer, educator and activist, recently attended Seed School in Arizona; Masaharu Noda, Manager of Santa Cruz Shumei Farm where pure seed is used as a key principle of Natural Agriculture; Axel Kratel, a consummate orchardist who also happens to be a physicist; and Zea Sonnabend, an inspector and policy person for CCOF, provides growers with the tools to farm with organic integrity. There was a really great article last month about how a UCSC college grad started up a seed bank in Santa Cruz to save heirloom seeds in the community. The 21-year-old UC–Santa Cruz history major founded the UCSC Demeter Seed Library last year, spurred by his fascination with heirloom plant varieties and a $10,000 grant from the Strauss Foundation. After just one growing season, the seed library is a treasure trove of more than 250 locally adapted heirloom varieties, all donated by master gardeners and seasoned farmers in the area. The seeds come in all shapes and sizes and are the progeny of familiar and well-loved produce like tomatoes, brassicas, beans and gourds, as well as rarities one would never expect to find thriving on the Central Coast—like the Ethiopian grain teff. He also incorporated the often used seed exchange format, to help gardeners obtain seeds for free in exchange for giving seeds back at the end of the growing season, which were harvested from the seeds first recieved. One thing I found interesting was the fact that three seed banks all started in Santa Cruz last year alone. I wish other areas would also get such an interest in heirloom seeds that they would start a single seed bank, let alone three. I did wonder if all three seed banks share amongst each other, or if gardeners are favoring one over the other, which could actually hurt seed saving efforts in that area. I am curious to know if others have situations where multiple seed banks in the same area were either sharing or competing for the heirloom seeds. Welcome while we get all our heirloom seeds information ported over to our new site! It will be a work in progress over the next few days, but then the database will be better than ever The veggie pages are going up first, then the individual pages for each variety of heirloom. Do you have any photos for any of the heirlooms we have? Since I unfortunately cannot grow all the varieties of heirlooms (although I wish I could!!) I would appreciate any support visitors can give, such as photos of heirlooms (the finished product, the plant or even the seeds), submit a comment and we will be sure to include it. We also include many variety of heirloom vegetables from history, even though we are unaware of any known surviving seeds. If you know of any seed availability (including seed banks that do not make the seeds available to the pubic) from any of the varieties listed as “no known surviving seeds” please make a comment so we can update the listing. We may have some duplicated where an older heirloom is known by a different name today. We hope to be able to update as many seeds as possible with availability. We will also be making posts about anything new and noteworthy in the world of heirloom seeds. And even while we are a work in progress, you can still submit any heirlooms we are missing to make the database as complete as possible. We have also been toying with the idea of offering a seed exchange board here, so people can connect to swap heirloom seeds as well, if enough visiting gardeners would like it. NOTE: HeirloomSeedsDB.com is NOT owned/associated/connected to any heirloom seed company. I love growing heirlooms but it was always super frustrating to have to go between 5 or 6 different seed sites just to pick which varieties of vegetables to grow each year. My goal is to provide avid heirloom loving gardeners with information on ALL heirlooms, since nearly every heirloom seed site out there restricts their listings to only the seeds they sell.